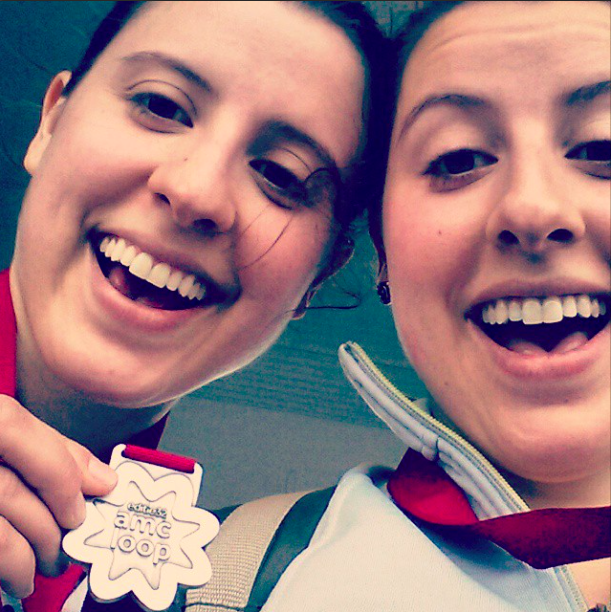 Posted on May 31, 2015 by Sarah S.
Since I had to miss this year’s Pittsburgh half marathon (for a good reason: this Europe trip! ), I haven’t actually participated in a race of any kind since my last triathlon last September. For me, that’s a long time to go without! So I asked my sister to help find a race in the Netherlands that we could run together. We ended up at the AMC Loop 10k, running with some of Dutch coworkers. There was one obvious Dutch-specific peril to this race: a near-constant, serious risk of being nailed in the face by an elbow. Life can be rough when everyone is an good foot taller than you… And while it was raining and I was experiencing the awful beginnings of an upper-respitory infection, the race was super fun. Angie and I ran an absolutely perfect negative split (each mile time gets faster and faster throughout the race) and a nine minute mile average. We celebrated with a fantastic healthy lunch in Utrecht (and soon I imagine also lots of cookie butter…). This post is #47 of the #The100DayProject. For more updates on my progress, be sure to follow me on Instagram and look for the hashtage, #100DaysofMiaPrima. This entry was posted in Running, Cycling, Triathlon, Travel and tagged 10k, amsterdam, dutch, holland, loop, race, run, running, the netherlands, travel. Bookmark the permalink.